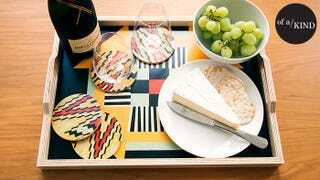 This fly, wood tray and coaster set? It’s ready to party. Get yours for $10 off with the code TRAYBIEN. There’s something undeniably grown-up about having a couple nice home things—even if said things are sitting on top of an Ikea table with a wobbly leg that’s survived five moves (barely). And this situation amps up any space. It’s bright. It’s cheery. And, it’s functional. Made in L.A. by the very talented Annabel Inganni of Wolfum, this combo’s itching to jazz up a holiday bash—or a Scandal-viewing sesh. And when you aren’t showing it off, use the tray to store your mail and keys and everything else you drop the second you walk in your door. Also! This makes an awesome present (because gifting season is nearly here—SOMEHOW). Get it now for $95 with the code TRAYBIEN. And while you’re at it, check out the other stuff to be had at Of a Kind—you can use that TRAYBIEN code at checkout for $10 off anything on the site through 11/8.